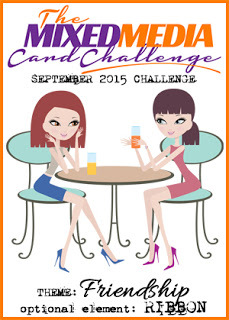 We've got a new challenge at The Mixed Media Card Challenge - Friendship, with an option of Ribbon. I also love using my craft iron to make encaustic wax scenes like this one. A couple of swipes of wax onto the iron, and swoosh across some glossy card, and you have a unique vista every time. I added a diecut flower which I'd waxed on the iron, then I drew borders with Neocolour II crayons which I diluted with water. I stencilled some dots on the right-hand side, and I was surprised that the colour took on the wax, I thought it would just wipe off. The sentiment is from Dee's Blooming Buds set. Pop on over to the blog to see the fabulous inspiration from the rest of the Design Team, and play along with us. Wow! This is sooooo cool and very pretty. I have never tried (or heard of) this technique before. Wonderfully gorgeous. I'll have to research this technique. Have you made a video tutorial of this technique? Love, love, love this card Shirley! It looks awesome. 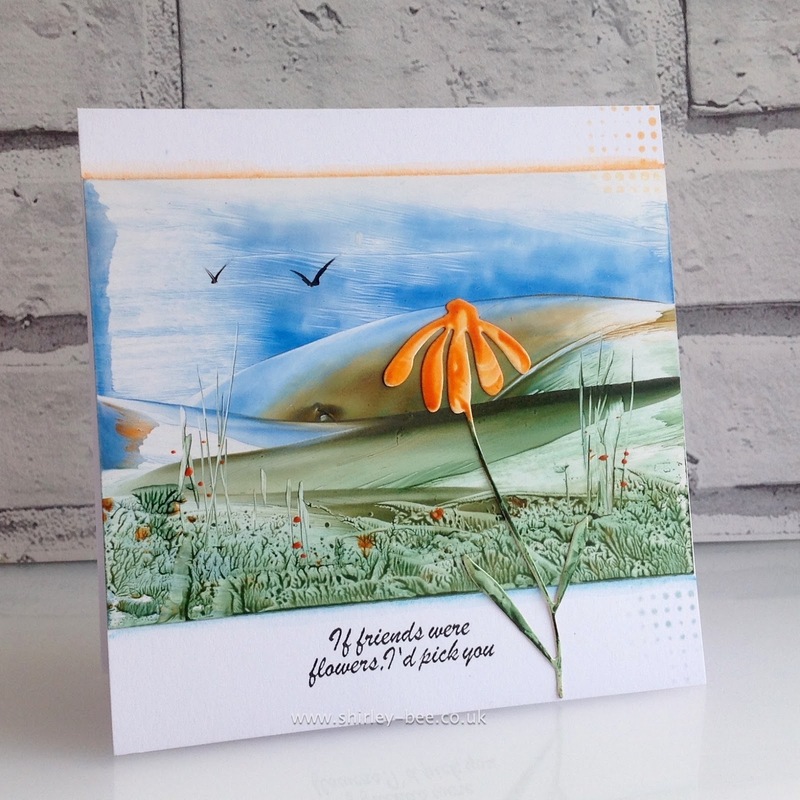 Gorgeous card Shirly! The scene is so beautiful and I love the flower. Stunning, beautiful, incredible, fantastic....wow, this truly is amazing! Never thought that an iron would make me smile, but it sure does when used like you have here! Wow, so creative and beautiful. Your encaustic's scene reminds me of our Oregon Coast sand dunes with the ocean in the background :-) I have been intrigued by encaustic's ever since seeing Biggan's beauties. TFS your description too Shirley. BTW, I am fine with ironing too! This is as amazing as it gets Shirley! Over the top fabulous. How I wish I could watch you in action! I would frame this card! Such great texture. I am not familiar with using wax but this card makes me want to give it a go. Gorgeous card!! Should have commented ages ago - I love this card! very beautiful landscape, wonderful card! Always mesmerizing, your waxed backgrounds. Feel free to stop by my house to iron anytime!